Coffee – golden liquid of productivity, helper in the morning and deliciousness in a cup. Ever since it made its way to Europe in the 17th century, the brown beans make deadlines easier to meet and waking up in the morning less of a chore. Especially in the past few years, Specialty Coffee has found many fans around the globe; with roasteries and plantations that have changed their of planting, growing, harvesting and roasting their beans. Prague truly is a Mecca for coffee gourmets and lovers; almost on every corner in the Capital sits a coffee shop that offers fresh and full-bodied cups. 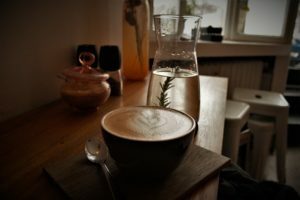 Because the choice is vast and some of the best spots hidden in alleys of the city of spires, we set out to taste all of the cups there are to get around the city and provide you with the best Coffee Places in Prague. But what exactly makes the beans that go into the cup to Specialty Coffee? The term ‘Specialty Coffee’ refers to the whole process from the farm to the cup. Not only the origins of the plants‘ beans but also the way the coffee is processed, roasted and extracted are embodied in it. Specialty coffee beans hold a very specific flavour – depending on the region they have been planted in, as well as the way they have been processed and roasted. When talking to a Specialty Coffee Barista, you will probably hear them say something like: “This coffee is from Costa Rica and holds notes of orange zest, dark chocolate and nuts”. This is not just to show off and sound smart; you can actually taste the notes when drinking espresso extracted from specialty coffee. Every region has its specific soil, sun hours, climates and so on; All of this goes into the bean that grows on a coffee plant. But of course, it is not just the plant itself giving the beans their flavour. Processing the beans makes a difference in flavour and body of the coffee in your cup, too. By processing we mean the way the beans are collected, washed and dried. The variations here range from fully-washed to washed and natural. Natural coffee beans, for example, are not washed but instead directly put to dry until pulped. This affects the notes of the beans, which you can taste in the final product. Roasting has become an art in itself: As the beans are roasted, their flavour notes change depending on how long and on what temperature they are sizzling in. But why exactly is Specialty Coffee supposed to be better than commercially produced coffee? 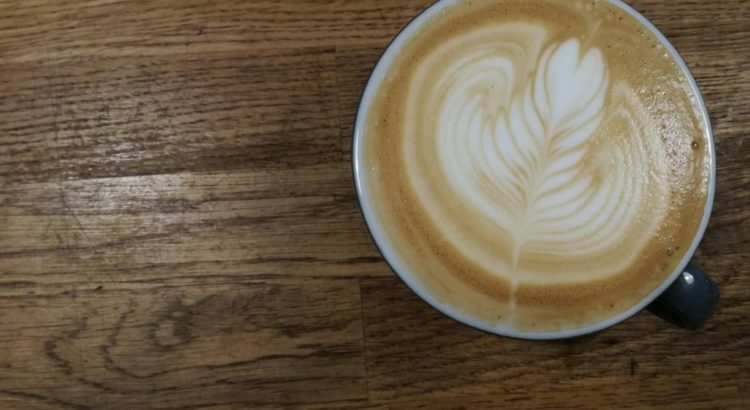 Not only are farmers that produce for a specialty coffee brand better off financially and treated fairer, the final product carries less bitter aftertaste, but delicious notes and leads to a wholesome experience when sitting in the coffee house next door. Commercially produced coffee also only offers a very limited assortment of blends and roasts. Furthermore, farms that produce commercial coffee often get paid by the amount they deliver, not the quality of the product. And so, unripe green beans or overly ripe beans often land in the package you buy; which is unhealthy and can make the whole pack of coffee taste bitter and burned. Specialty Coffee farmers select the beans very carefully, which results in a well-balanced and healthy coffee product. When thinking of Specialty Coffee, many think of the big German city not far away from Prague: Berlin. 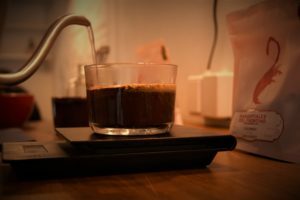 While it is true that Berlin inhabits many specialty coffee shops, Prague’s specialty coffee scene has grown tremendously in the past few years. And that is why we get to enjoy wholesome coffee all around the city by now. Not only coffee shops are opening more and more, also festivals – such as the Prague Coffee Festival – dedicated to learning about coffee and tasting the differences between specialty and commercial coffee have been created. Now enough of the talk, let’s get some coffee! Thought there is no Specialty Coffee to get in Old Town? Well, you are wrong. Supertramp is well hidden in an alleyway just off busy Lazarská street. 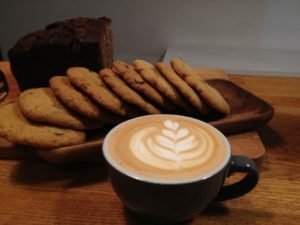 For those that find their way to the warm, lovingly decorated coffee place will be rewarded with delicious coffee specialties. Be sure to come hungry, for they offer a wide and creative assortment of sweet and salty delicacies. 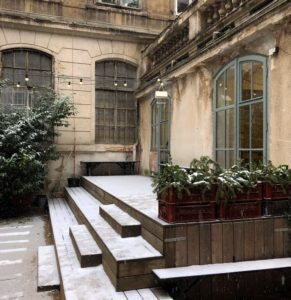 Take all of that out to their veranda in the historic, old building and get a well-deserved break from the day. A Bistro? Yes, a Bistro. Bistro 8, located just off busy Jiřího z Poděbrad square, works with one of the absolute best roasteries we have come across. Climpson and Sons from London deliver their tasty coffee beans to the Bistro next to the TV Tower. And boy, what a milk foam you get at theirs! If you are not just hungry for a good cup of coffee but also something solid; Bistro 8 serves all day brunch and delicious, healthy lunch menus at an unbeatable price for the quality. Right around the corner is what probably is the smallest branch of Mamacoffee in the city. 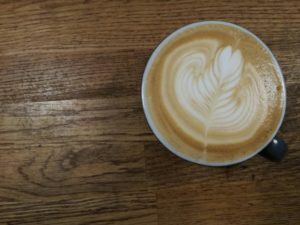 While Mamacoffee has many locations around town, their quality never disappoints. They are also roasting their own coffee, which of course is sold in their branches. This spot is especially nice after a Saturday walk. Sit down outside or inside, where it is cozy, small and very intimate. Lovely coffee and accessories can be bought here, too. Prague 2 spreads wide, all the way down to Náměstí Míru. 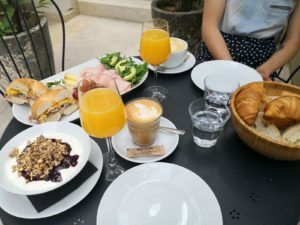 Somewhere in between JZP and the Church of St. Ludmila, on Moravská street, hides one of our absolute favourite coffee – and brunch – spots: Monolok. Upon entering the bright and cozy place, you might think there is not enough seating available. If you go on through the hallway however, you will discover a whole downstairs area and a garden. Especially in Spring and Summer, this is where you want to sit down and have a full-bodied cuppa and a lovely breakfast for 2! Upper Žižkov does not get enough love from foodies and coffee lovers. Let us change that by bringing two cozy places with phenomenal coffee in your life! 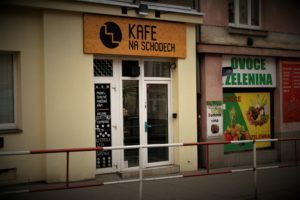 Never heard of Kafe Na Schodech? You have been missing out then. The small area offers limited seating but is optimal for people on the run. Not only does Na Schodech work with a local roastery – Kávový Klub – they also use biodegradable cups for to go orders, sell coffee by the gram and if you do not have one yet, KeepCups. This place is – unfortunately – widely unknown. If you have not tried their coffee yet, you should definitely make your way to Žižkov and chat with the friendly owner of the place while sipping some delicious coffee. Oh, by the way: The coffee house is conveniently located right next to Biskupcova tram stop. If you prefer to sit down for your coffee (and maybe a piece of cake), Marmeláda awaits you just a block away from Na Schodech. 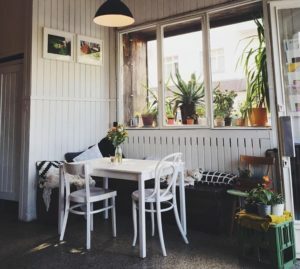 With their simple but cozy interior, TAM DEM coffee and lovingly made cakes, visiting Marmeláda is a Sunday delight. Prague 4’s district is massive – and even though many coffee places are sitting in Prague 1, 2 and 7, there are plenty of options in the South of Prague to have a warm, perfectly brewed coffee, too! 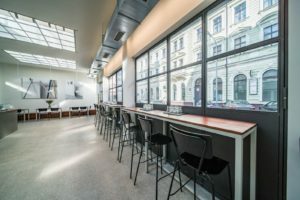 Café Periferie with its modern yet comfortable and soulful interior serves TAM DEM coffee along with eggs and Czech dessert classics such as koláč and štrůdl. When in Prague 4, you definitely should go and check out Sapa Market (often called ‘Little Hanoi’). Not just for the experience and the produce, but also for the traditional Vietnamese Drip Coffee adventure. You can find the latter in every Kavárna on the Sapa Market area. Just a few minutes walk from Střelecký Ostrov, located in the narrow streets of Prague’s Lesser Town sits a pearl of a Coffee Place: Café Lounge. Working with Czech or European Micro-Roasteries, you can be sure to get a cup of happiness when visiting the hip and comfortable spot in Prague 5. Have we mentioned that they serve finger-licking good brunch on weekdays (until 11:00) and weekends (until 17:00)? It was only a matter of time until Specialty Coffee would hit Prague 6 – and we are so happy it did! Kavárna Misto is a modern, big place to enjoy your cup of happiness. Whether you want to sit down or stand, chill out or work, Misto has what you need. With the daily batch brew, three different varieties of filtered coffee and – of course – milk drinks, Misto makes a coffee lover’s dream come true. Prague 7 is one of the many districts in the capital where a coffee lover can go almost door to door to experience different roasteries, cups and notes in just one afternoon. Starting off in Holešovice, tucked away behind the well-known VNITROBLOCK, lies a pearl of a specialty Coffee Shop: Barry Higgel’s Coffeehouse. Barry Higgels’ team will brew you a perfect cup of coffee that will wake you up smoothly. Especially cool: They change their roastery monthly, so you can go on a journey around the coffee world with them. Barry Higgels also offers discounts on their to go drinks when you bring your own cup, supporting the upcoming Zero Waste trend in the city. We think that is absolutely clutch! The staff is very nice and speaks fluent English. Have we mentioned they do brunch on weekends? If you feel like you want to enjoy your coffee at home, no problem, either: They sell Espresso Beans by the gram and bagged Filter Coffee Beans of the featured roastery in their shop. From Barry Higgels, you can continue your specialty coffee tour towards Miladý Horákové. If there is a main street for coffee shops in the city, it is probably this one. Four specialty coffee places have found their home on the long street in Prague 7. Welcoming you in the neighbourhood is Cobra. A café and bistro by day, a bustling bar with wonderful drinks by night. And in the spotlight: Perfectly brewed Specialty Coffee. Cobra works with a Czech roastery – Project Fox – located in Žižkov. By having a cup of the golden liquid you not only support a local roaster but also get to enjoy finger-licking good brunches, lunches and dinners. Last but definitely not least is Solista Café just a short walk up the hill. Solista is – as the name might give away – very small, but we promise, their coffee performance is anything but that! Perfectly brewed coffee and wonderful sweet treats await you in the bright coffee spot. Take your order to their outside seating area, get envious looks for your coffee and enjoy the sunny day out in Letná. Karlín is probably the Rolls Royce of specialty coffee places. Though this does not come unexpected – as Karlín is often dubbed as the hipster district – we might have a place or two in store that you have not checked out. Můj šálek kávy is easily one of the top coffee places and gets a lot of attention by many guides. Not undeserved: Their espresso is always on point, their milk foam perfect and their staff just lovely. What more can we say except: Go and have your perfect cup of coffee! Once at it, you might as well stop by Eska. Not only a top notch restaurant but also perfect coffee place with home-baked goodies, self-made Cold Brew and Buchty to die for. Eska is located opposite of FORUM Karlín and is a buzzing place. While sipping your perfectly brewed cup of the golden liquid you get to watch the cooks, pastry chefs and co. preparing five star dishes for their restaurant upstairs. Not over caffeinated yet? Good, because there is another pearl waiting to be discovered in Prague 8. For this, you want to get a tram to Palmovka. This is where EMA has opened its new branch. 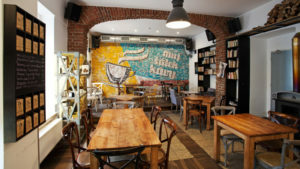 Unlike their smaller coffee house in Old Town, this place offers a lot of seating and modern furnishing. 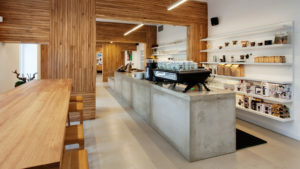 EMA is widely known to be one of the best coffee places around the city – and their new location lives up to the high remuneration they have. Yes, even a bit out of the center Specialty Coffee can be found. And not just that! Pragovka – we reported about it in our article ‘ARTSPOTTING‘ – is a big, former industrial space that has been given a new use. Since 2016 it offers artists a place to work on and showcase pieces. 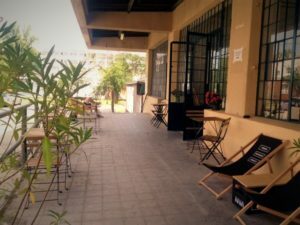 Of course, marveling at art and walking through the huge former factory makes a mind and body tired – and so Pragovka opened their own coffee spot with just about the best outside seating area and modern inside. Serving both drip coffee and espresso, Kafe Pragovka is well worth a trip out to Prague 9. Miss your mum’s cakes? 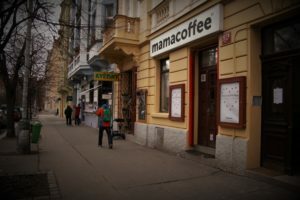 Vršovice’s new coffee place ‘Tvoje Mama’ (Your Momma) might help with that. Delicious, fresh and homemade tartes, cakes and other sweet delicacies will brighten your day no matter how bad it is. 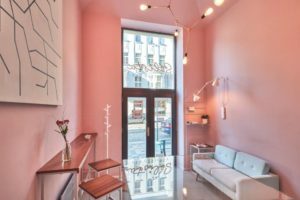 With a cozy and stylish interior, Tvoje Máma not only inspires sweet teeth to hop in. They also work with the Czech Coffee Roaster “Caffka”. A wonderful afternoon spent is a visit at the bright, newly opened place in Prague 10. If you happen to visit Chodov’s shopping mall and feel an urge for a good, caffeinated drink, Narcoffee will set you up with a cup of coffee that will give you the caffeine punch you need. They do not only sell coffee, they also roast it themselves – and boy, is it delicious! Fresh colours, a bright space, delicious cakes and phenomenal coffee drinks. This is Helen’s Coffee in Prague Stodůlky. This is the perfect spot to go to for a good cup after a nice walk through Centralní Park, which is only a few minutes walk away. Whether you enjoy their stylish interior or sunbathe on their outside seating area; Helen knows how to make a good day become a perfect one. Prague holds a vast selection of wonderful coffee spots. 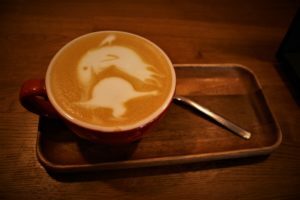 Do you have a favourite coffee place in Prague you want to share with other fellow coffee lovers? Have you been to one of the places mentioned above and want to share your experience? Tell us all about it in the comments! Stay caffeinated!